These are very projecting sounding flatwounds. They are nearly as bright as boomers but not quite. They're not the very smoothest feeling flats, being ground down & all. But they're still great feeling, near noiseless + the projection (i'm trying em on the Emperor Swingster/ love it so far). They got me what I wanted before I expected it. Using these very successfully for Gypsy Jazz (Gitane D500). Any type of acoustic bronze is too bright on a GJ guitar, and I find conventional GJ strings have too much pick-scrape sound for my taste, especially when playing rhythm. These are bright and loud on acoustic guitar, much louder than nickel or stainless steel-wound. (They don't make it very clear in their marketing materials, but these are wound with Alloy 52.) Alloy 52 is nearly as dense as Bronze or Copper windings (as used in GJ strings), the smooth surface eliminates squeaking and the strings last considerably longer than legit GJ strings. And the tension of the 720 set is just about right. I have guitar repair friend who says that the centerless grinding process used in manufacturing is prone to making bad strings, but I've not had any problems up to this point. That said, he has seen many more of these strings the have I.
I'm always mystified when people say that D'Addario Half Rounds are comparable to these... to my ear the D'adds, which are stainless-steel-wound, are garishly bright (much brighter than D'Add XL's, for example), and harsh; and don't have the necessary volume on an acoustic instrument. 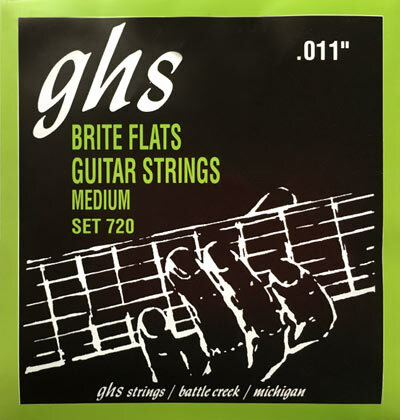 For my purposes, GHS Brite Flats are better by a wide margin.